Utagawa Yoshikazu (active 1850-1870) Tametomo Repelling Smallpox from the Island of Oshima, 1850's. Oban Diptych. The Wellcome Foundation has the left hand sheet of this fine print in its collection. This is the only complete copy of the diptych that I know of. These prints of medicine are rare and highly collectible and this fine piece by the Utagawa School artist Yoshikazu tells the no doubt apocryphal story of the Japanese hero Tametomo and his unconventional approach to disease prevention. Tametomo is one of those rebellious youths of great strength and skill who were revived in the nineteenth century as part of the cultural discontent that found its expression on the stage and in the prints of the entire century. Tametomo’s particular skill was his outstanding archery and he is seen here leaning on his bow, gazing menacingly down at the disappearing figure of the smallpox virus on his straw mat. 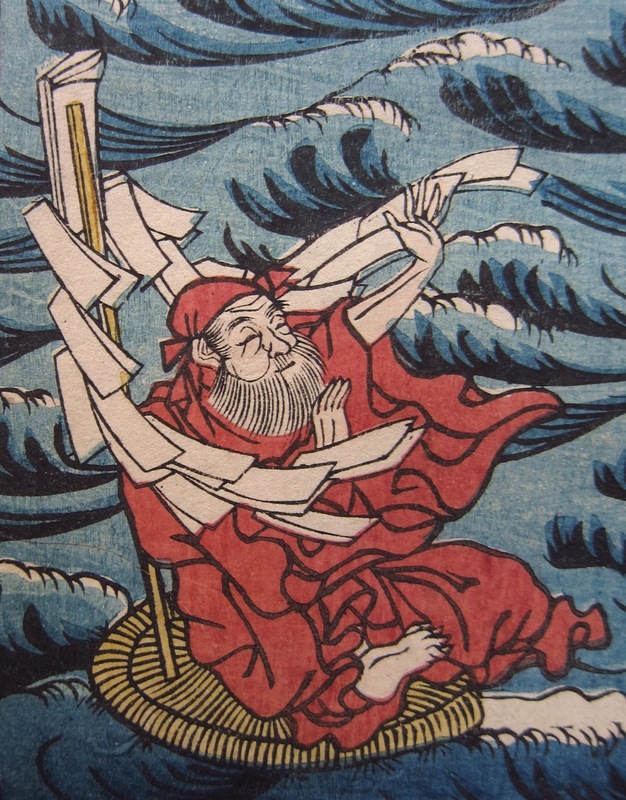 Tametomo had been exiled to the island of Oshima for insurrection. One day, whilst walking by the sea he saw a straw mat on which sat a tiny man one foot five inches high. Tametomo challenged the old man who said, "I am the microbe of smallpox." Tametomo asked why he had come to the island and the old man said that he was sightseeing and wished also to seize hold of the inhabitants. Tametomo threatened the microbe so fiercely that the old man shrank in size until he was no larger than a pea and floated harmlessly out to sea. Oshima has never experienced smallpox before or since! The story is reminiscent of Saint Patrick banishing snakes from Ireland. 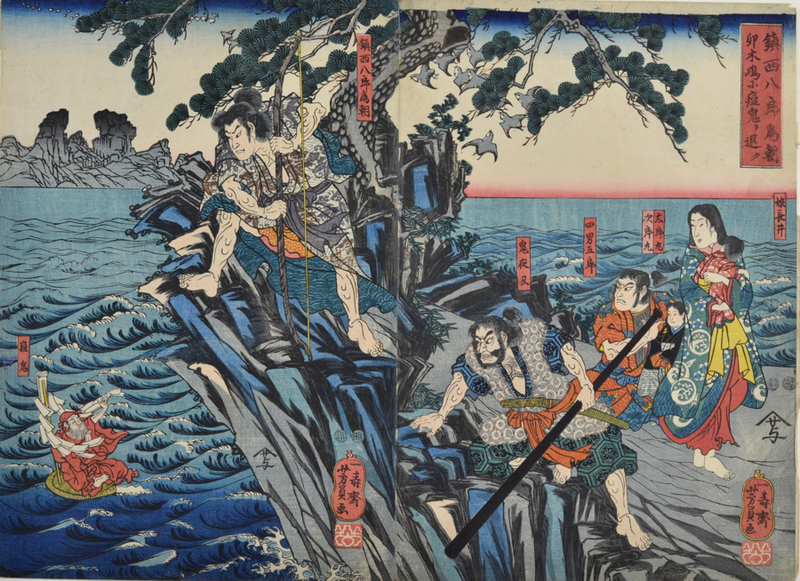 Yoshikazu shows the (charming) smallpox demon being cast out to sea, whilst behind him are his retainers and islanders. 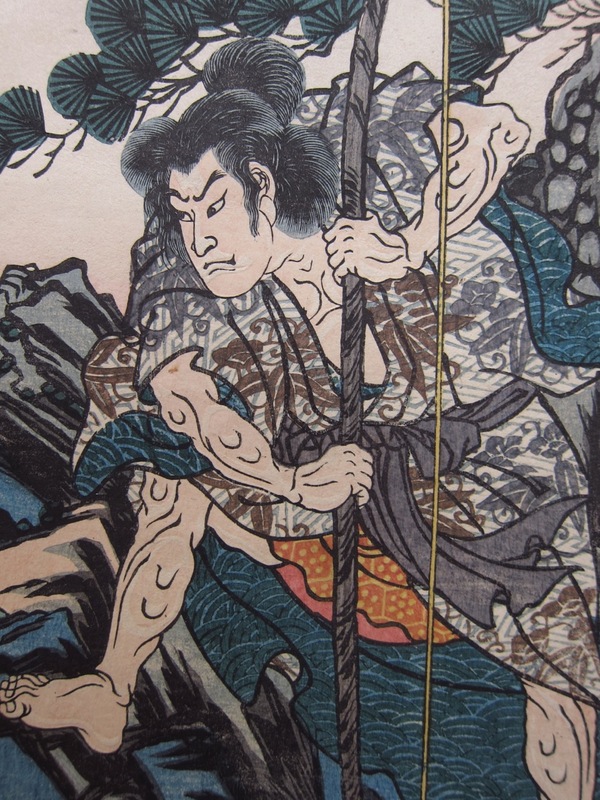 The print has all the characteristics of mid-century Utagawa prints - the landscape is wholly derived from Hiroshige, the figures from Kuniyoshi and the subject of the rebelious and exiled hero fits perfectly with the sense of disenfranchisement felt by the Edoists and the Chonin. The print is in very good condition, colour and impression are both fine.